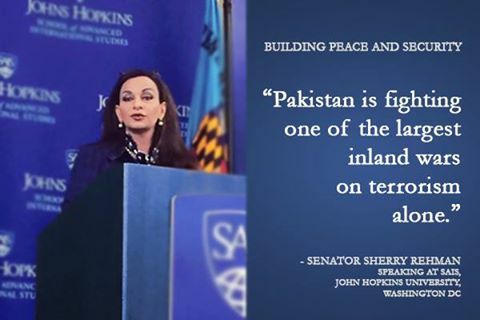 February 11, 2016, Washington DC: “Pakistan is fighting one of the largest inland wars on terrorism alone, I don’t see anyone else stepping up to resource this battle, although this is hardly strategic justice,” stated Senator Sherry Rehman while speaking at a wide-ranging talk on building Pakistan’s peace and security. 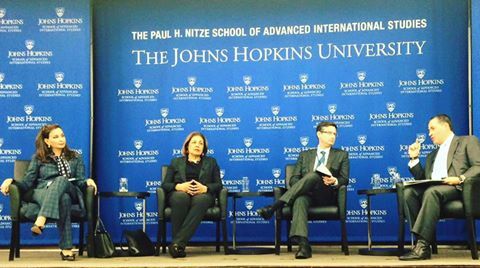 The former Pakistan’s Ambassador to the US was speaking at the School of Advanced International Studies, at John Hopkins University, in Washington DC. “After the bloodbaths in Peshawar and Charsaddah where our students were targetted, we cannot just watch as the inferno unfolds from North Waziristan operations,” the Senator said, referring to attacks by militants on two schools in Pakistan. “We are not laying the blame on other countries, nor do we get into finger-pointing about whose ungoverned spaces provide sanctuary for which high value target, because it is not easy, we know, and often the enemy is within, but its not a black and white reality,” specified Rehman, stressing that while Pakistan takes responsibility for its own soil,terrorism was now a global epidemic, and there was now an urgent need for the international community to build a lasting multilateral coalition against it. Hosted by Dean Vali Nasr, Rehman also spoke at a panel with Daniel Markey and Ambassador Shirin Tahir-Kheli where she fielded questions on a wide range of foreign and security policy issues from a packed hall, with members of the strategic policy community to academic and students. “Violent extremism is not something that can be contained by kinetic means alone, and it must be addressed as a hearts-and-mind challenge. It means facing up to the reality that we, including the United States, have made policy miscalculations both at home and abroad,” Rehman declared. On a democratic Pakistan, she said that Pakistan was now in a serious long-haul battle pitched between Jinnah’s Pakistan and Zia’s Pakistan, adding that mainstream Pakistan votes for Jinnah and his vision. “We do not vote in religious parties to the PM’s office, and we are now looking to reverse the extremism that has crept into society at the hands of a dictator we neither chose nor coddled. But Pakistan has devolved power to its provinces, thanks to the PPP government in power in Islamabad last time, and must answer to a robust parliament,” she told the audience. Dean Nasr was quick to appreciate the Pakistan Parliament’s decision to stay out of the Middle East’s sectarian conflict, while noting China’s enhanced role in the region, which Rehman saw as a net positive for economic stability, especially with the growing need for jobs in a large youth cohort. Rehman also said that peace in the region always ranks high with democratic governments, and added today we have some space and opportunity to connect with our neighbours for trade and energy security, but unfortunately the global community looks like it may leave many of Afghanistan’s conflicts to sort themselves out if the political reconciliation process does not work there. So far, she observed, the politics of reconciliation still seems a distant goal in any framework that preserves gains for women and even development. “I hope a political settlement for Afghanistan is not just a bumper sticker, and that Pakistan will not be left with the fallout of this long war next door again. Thirty years ago we apparently won a war together in Afghanistan, but I am very clear about what that did to my country. We won the war there, but lost the peace. This time it looks like nobody is winning the war or the peace, which is unsettling for all stakeholders in inclusive, progressive societies,” Rehman asserted. She reiterated that Pakistan is not treating Afghanistan as its strategic backyard anymore, but our refugee issue always becomes a niche conversation, while the rest of the globe closes its borders to the 21st century’s biggest nightmare, the problem of dispossession by conflict. “These conversations have to be put back on the front-burner like they were in 1989 between Rajiv Gandhi and Benazir Bhutto Shaheed,” she concluded.